parduodu Playstation 3 PS3 originalius žaidimus. Naujus ir naudotus. Populiariausi išvardinti apačioje, turiu ir kitų, retesnių. Galiu gauti bet kurį Jums reikalingą žaidimą. Nauji, užpakuoti, 10-30Lt. brangesni už atpakuotus. Prekiauju tik originaliais, PAL, puikios būklės, be jokių įbrėžimų žaidimais. Naujienos kiekvieną savaitę. 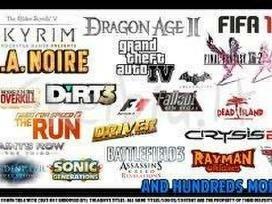 Lego Marvel Avengers, Call of Duty: Black Ops III, Wwe 2k17, Minecraft: Story Mode, FIFA18 NBA 2K18 Metal gear solid, Mad Max Mortal Kombat, Battlefield Hardline, Resident Evil Revelations 2 Dragonball XenoVerse Far cry 4, Assassins creed rogue Call of duty adwanced warfare, wwe2k17, Just dance 2018, NBA 2k17 FIFA 17 , NHL15, FARCRY 3, Destiny, DIABLO reaper of souls, plants vs zombies garden warfare, Wolfenstein, Watch dogs, minecraft, THIEF, Lego marvel super heroes, Lego movie, GRAN TURISMO 6, need for speed Rivals, Call of duty GHOSTS, Battlefield4, Assassins creed4, WWE14, NHL14, FIFA14, NBA2K14, Grand theft auto V, GTA5, PES2014, PAYDAY 2, THE LAST OF US , Resident Evil revelations, BIOSHOCK, ARMY of TWO, Tomb RAIDER, GOD of WAR Ascension, Dead Space3 , Crysis3, Hitman Call of duty Black Ops 2, Assassins creed III,MEDAL OF HONOUR WARFIGHTER, Angry birds, WWE13, NBA 2K13, FIFA13, RESIDENT EVIL 6, TEKKEN TAG2, 007, NHL13 F1 2012, Need for speed Most wanted, Assassins creed III 3, ir daug kt. www. Pigioskonsoles.lt prekyba naujais ir naudotais žaidimų kompiuteriais, jų priedais bei originaliais žaidimais. Visoje Lietuvoje nemokamas siuntimas. Galimi mainai i jusu Ps3, Ps4 ar Xbox 360 kompiuteri. Prekiaujame naujais ir naudotais Xbox one žaidimais Klaipedoje. ASSASSINS CREED IV BLACK FLAG XBOX ONE (NAUDOTAS) 14.98 € Assassins Creed Unity Xbox One 9.98 € ATTACK ON TITAN Wings of Freedom Xbox One 9.98 € Batman Arkham Knight (Xbox One) NAUDOTAS 9.98 € Battlefield 1 Xbox One 14.98 € Battlefield 4 (Xbox One) Naudotas 12.98 € Battlefield Hardline Xbox One 9.98 € Call Of Duty Advanced Warfare 12.98 € Call of Duty Infinite Warfare (Xbox One) NAUDOTAS 10.98 € Dead Rising 3 (Xbox One) NAUDOTAS 14.98 € Destiny 2 (Xbox One) NAUDOTAS 9.98 € Destiny Xbox One 3.98 € Dishonored 2 (Xbox One) 8.98 € Dishonored Definitive Edition (XBOX ONE) 7.98 € Dragon Age Inquisition Xbox One 13.98 € Evolve (Xbox One) NAUDOTAS 5.98 € Fallout 4 (Xbox One) NAUDOTAS 9.98 € FIFA 14 (XBOX ONE) NAUDOTAS 2.48 € Fifa 15 Xbox One 2.98 € Fifa 16 Xbox One 3.98 € FIFA 18 (Xbox One) NAUDOTAS 14.98 € Forza 5 (Xbox One) 11.98 € Forza Horizon 2 (XBOX ONE) NAUDOTAS 16.98 € Forza Motorsport 6 (XBOX ONE) 16.98 € GEARS OF WAR 4 (XBOX ONE) NAUDOTAS 15.98 € Gears of War Ultimate Edition (Xbox One) NAUDOTAS 9.98 € Halo 5 Guardians (Xbox One) 12.88 € Killer Instinct (Xbox One) Naudotas 9.98 € Life is Strange (Xbox One) 9.98 € Mass Effect Andromeda (Xbox One) NAUDOTAS 12.98 € Metal Gear Solid V Ground Zeroes Xbox One 6.98 € Metal Gear Solid V The Definitive Experience (XBOX ONE) NAUDOTAS 12.58 € Metro Last Light REDUX (Xbox One) NAUDOTAS 13.98 € Middle Earth Shadow of Mordor GOTY (Xbox One) NAUDOTAS 13.98 € Monopoly Family Fun Pack (Xbox One) Naudotas 11.98 € NBA 2K17 XBOX ONE 14.98 € Overwatch (Xbox One) NAUDOTAS 12.98 € Plants vs. Zombies Garden Warfare (Xbox One) Naudotas 14.98 € Resident Evil Revelations 2 (Xbox One) NAUDOTAS 9.98 € Ryse Son of Rome Xbox One 7.98 € Sherlock Holmes The Devils Daughter (Xbox One) 13.58 € South Park The Fractured But Whole (Xbox One) NAUDOTAS 17.98 € Star Wars Battlefront Xbox One 6.98 € STATE OF DECAY YEAR ONE SURVIVAL EDITION XBOX ONE(NAUDOTAS) 12.98 € Styx Shards of Darkness (Xbox One) NAUJAS 15.96 € Sunset Overdrive Xbox One 9.98 € SYBERIA 3 (XBOX ONE) NAUJAS 11.98 € THE CREW (xbox One) Naudotas 9.98 € The Elder Scrolls Online (Xbox One) NAUDOTAS 3.98 € The Walking Dead Season Two Xbox one 13.98 € Thief (Xbox One) Naudotas 11.98 € Tom Clancy Rainbow Six Siege Xbox One 17.98 € Tom Clancys The Division (Xbox One) Naudotas 9.98 € Tony Hawks Pro Skater 5 (Xbox One) NAUDOTAS 15.98 € UFC Xbox One 12.98 € W2K17 (Xbox One) NAUDOTAS 11.98 € Watch Dogs (Xbox One) 5.98 € Watch Dogs 2 (Xbox One) NAUDOTAS 14.98 € Witcher 3 Wild hunt Xbox One 17.98 € Wolfenstein The New Order (Xbox One) Naudotas 9.98 € Wolfenstein The Old Blood 9.98 € Klaipeda, i kitus miestus siunciu. 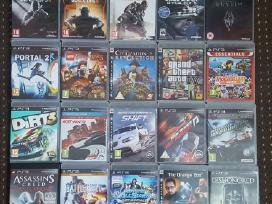 Parduodu originalius PS3 žaidimus (atnaujintas 2019.03.09): :TOP: NBA 2k10 - 10eur The Walking Dead - 10eur The Simpsons - 10eur CIVILIZATION: Revolution - 10eur HEAVY RAIN - 8eur CALL OF DUTY: BLACK OPS II - 8eur Playstation ALL STARS: BATTLE ROYALE - 12eur DIRT 3 - 15eur 007 LEGENDS (James Bond Agent 007) - 8eur ASSASSINS CREED: BLACK FLAG - 9eur ASSASSINS CREED: BROTHERHOOD - 9eur ASSASSINS CREED: REVELATIONS - 9eur ARMY OF TWO - 5eur AVATAR: THE GAME - 8eur BATMAN: ARKHAM ASYLUM - 7eur BATMAN: ARKHAM ORIGINS - 10eur BATTLEFIELD 3 - Limited Edition - 4eur BATTLEFIELD 4 - 10eur BIOSHOCK 2 - 6eur CALL OF DUTY: MODERN WARFARE 3 - 6eur CALL OF DUTY: GHOSTS - 8eur CALL OF DUTY: ADVANCED WARFARE - 8eur CALL OF DUTY: BLACK OPS II - 8eur DEAD ISLAND - 6eur DISHONORED - 10eur DRAGON AGE: ORIGINS - 8eur EVERYBODYS GOLF: WORLD TOUR - 6eur FALLOUT 3 - 6eur GODFATHER II - 8eur GOD OF WAR: ASCENSION - 10eur GTA IV 4 - 8eur GTA V 5 - 13eur HEAVENLY SWORD - 8eur L.A. NOIRE - 5eur LITTLE BIG PLANET - 6eur LORD OF THE RINGS CONQUEST - 8eur LOST PLANET 2 - 6eur MAX PAYNE 3 - 5eur PIRATES OF CARIBBEAN: AT WORLDS END - 7eur PORTAL 2 - 10eur RAGE - 5eur RED DEAD REDEMPTION - 8eur RED DEAD REDEMPTION: Undead Nightmare - 8eur RESIDENT EVIL 5 - 7eur SAINTS ROW: THE THIRD - 4eur SKYRIM - 8eur SLEEPING DOGS - 7eur Summer Olympics London 2012 - 5eur TRANSFORMERS: THE GAME - 6eur UNCHARTED 1: DRAKES FORTUNE - 6eur UNCHARTED 2: AMONG THIEVES - 8eur UNREAL TOURNAMENT 3 - 7eur :MUSTYNES: Virtua Fighter 5 - 8eur Supremacy MMA - 8eur :LENKTYNES: DIRT 3 - 15eur DRIVER: SAN FRANCISCO - 8eur BURNOUT PARADISE - 7eur GRAND TURISMO 5 - 6eur SPLIT/SECOND: VELOCITY - 7eur RIDGERACER: UNBOUNDED - 8eur NEED FOR SPEED (NFS): SHIFT (special edition box) - 9eur NEED FOR SPEED (NFS): MOST WANTED - 9 eur NEED FOR SPEED (NFS): HOT PERSUIT - 9 eur NEED FOR SPEED (NFS): RUN - 11 eur MODNATION RACERS - 10eur :SPORTAS: NBA 2K10 - 10eur FIFA Street - 5eur FIFA 13 - 5eur FIFA 15 - 8eur FIFA 16 - 12eur Summer Olympics London 2012 - 5eur JUST DANCE 2016 - 8eur SHAUN WHITE SNOWBOARD - 5eur Tony Hawk: Shred - 5eur EVERYBODYS GOLF: WORLD TOUR - 6eur GOLF: Tiger Woods PGA Tour 07 - 3eur :VAIKAMS: LITTLE BIG PLANET - 6eur JUST DANCE 2016 - 8eur MODNATION RACERS - 10 EUR Playstation ALL STARS: BATTLE ROYALE - 12eur The Simpsons - 10eur EVERYBODYS GOLF: WORLD TOUR - 6eur :FANTASY: DRAGON AGE: ORIGINS - 8 eur GOD OF WAR: ASCENSION - 10eur HEAVENLY SWORD - 8eur LORD OF THE RINGS CONQUEST - 8eur -Parduotas-ASSASSINS CREED 3 -Parduotas-FAR CRY 3 -Parduotas-UNCHARTED 3: DRAKES DECEPTION -Parduotas-WATCH DOGS -Parduotas-CALL OF DUTY: BLACK OPS III -Parduotas-DIABLO 3: Reaper Souls -Parduotas-3 in 1: Ultimate Action: Tomb Raider, Sleeping Dogs, Just Cause 2 -Parduotas-ORANGE BOX: HALF LIFE 2 + TEAM FORTRESS 2 + PORTAL -Parduotas-LEGO: LORD OF THE RINGS -Parduotas-LEGO: Star Wars - Force Awakens -Parduotas-GRAND TURISMO 6 Atsakau į sms. Tik Vilnius, paštu nesiųnčiu. Parduodami naudoti PS3 žaidimai: Daugiau informacijos psl. : linkme.lt Alpha Protocol - 5 Alien: Isolation - 14 Aliens vs Predator - 6 Aliens Colonial Marines - 7 Army of Two: 40th day - 8 Assassins Creed - 5 Assassins Creed 2 - 7 Assassins Creed 3 - 7 Assassins Creed Black Flag - 9 Assassins Creed Revelations - 5 Assassins Creed Rogue - 10 Battlefield 3 - 5 Battlefield 4 - 8 Battlefield Bad Company 2( tik diskas) - 3 Battlefield Bad Company 2 - 6 Battlefield Hardline - 10 Batman Arkham City - 8 Batman Arkham City GOTY - 13 Batman Arkham Asylum - 9 Batman Arkham Origins - 10 Bioshock 2 - 7 Bioshock Infinite - 10 Blur - 15 Bodycount - 5 Borderlands - 7 Brink - 6 Bulletstorm - 6 Call of Duty: Black OPS - 7 Call of Duty: Black OPS 2 - 8 Call of Duty: Black OPS 3 - 11 Call of Duty Advanced Warfare - 8 Call of Duty 4: Modern Warfare - 4 Call of Duty: Modern Warfare 2 - 5 Call of Duty: Modern Warfare 3 - 6 Call of Duty: World at War - 4 Call of Duty: Ghosts - 5 Call of Juarez: Bound in Blood - 5 Castlevania: Lords of Shadow - 9 Crysis 3 - 8 Child of Eden (Move žaidimas) - 7 Dantes inferno - 9 Dark Souls - 10 Dark Souls: Prepare to Die Edition - 20 Dark Souls 2 - 12 Darksiders - 7 Darksiders 2 - 13 Dead Island - 9 Dead Space 3 -10 Dead to Rights: Retribution - 6 Deadrising 2 - 9 Defiance - 3 Destiny - 5 Disney Sing It: Party Hits - 5 Dragon Age 2 - 8 Dragon Ball Ultimate Tenkaichi -16 Dragon Ball Xenoverse - 21 Dragons Dogma - 7 Duke Nukem Forever - 6 Eye Pet (move žaidimas, be viršelio) - 7 Fallout 3 - 8 Fallout New Vegas - 10 Farcry 2 - 6 Farcry 4 - 13 Fifa 08 - 1 Fifa 10 - 1 Fifa 11 - 1 Fifa 12 - 1 Fifa 13 - 3 Fifa 16 - 6 Fifa 17 - 15 Final Fantasy XIII - 9 Genji: Days of the Blade - 4 GI Joe The Rise of Cobra - 4 God of War 3 - 8 Gran Turismo 5 Prologue - 7 Grand Theft Auto 4 - 7 Grand Theft Auto Episodes from Liberty City - 8 Grand Theft Auto 5 (GTA 5) - 15 Guitar Hero World Tour - 7 Guitar Hero Metallica - 6 Heavy Rain - 7 Heavenly Sword - 5 Hitman Absolution - 7 Infamous 2 - 11 Just Dance 4 - 8 Just Dance 2016 - 15 Kane & Lynch Dead Men - 4 Killzone 2 - 7 Killzone 3 - 8 La Noire - 7 Little Big Planet - 8 Little Big Planet 2 - 12 London 2012 - 5 Lord of the Rings: Conquest - 6 Mafia 2 - 11 Max Payne 3 - 4 Metal Gear Rising: Revengeance - 8 Metal Gear Solid 4: Guns of the Patriots - 7 Mirrors Edge - 7 Mortal Kombat - 15 MotorStorm - 6 MotorStorm Pacific Rift - 9 MotoGP 08 - 5 MX vs. ATV Reflex - 9 Need For Speed Most Wanted - 9 Need For Speed Prostreet - 7 NBA 2K13 - 7 NBA 2K14 - 8 NBA 2k15 - 11 NInja Gaiden Sigma - 6 Payday 2 - 14 PES2011 - 1 Race Driver: Grid - 6 Rachet and Clank: Tools of Destruction - 12 Red Dead Redemption - 12 Resident Evil 5 - 7 Resident Evil 5 - 8 Resistance: Fall of Man - 4 Resistance 2 - 6 Resistance 3	- 6 Ride to Hell: Retribution - 6 Rocksmith - 10 Saints Row The Third - 5 Saints Row IV - 8 SingStar Take That - 7 Skyrim - 6 Skyrim(tik diskas) - 3 Sleeping Dogs - 9 Skate 3 - 13 Star Wars The Force Unleashed 2 - The Fight (PS3 move) - 5 The Last of Us - 12 TNA Impact - 5 Tomb Raider - 12 Tomb Raider Underworld - 7 Tom Clancys RainbowSix Vegas 2 - 7 Tom Clancys End War - 4 Tom Clancys Ghost Recon 2 Advanced Warfighter - 5 Turok - 6 UFC 2009 Undisputed - 7 Uncharted: Drakes Fortune - 5 Uncharted 2 Among Thieves - 6 Uncharted 3 Drakes Deception - 9 Vanquish - 5 Virtua Fighter 5 - 7 X-Men Destiny - 15 WWE13 - 4 W2k14 - 4 Watch Dogs - 12 Siuntimas registruotu paštu - 1.5 euro. 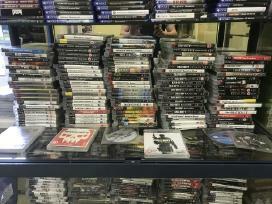 FarCry 4 - 8€ Fifa 13 - 5€ BattleField 3 - 6€ Call of duty Ghosts - 9€ Assassins creed 3 - 7€ Watch Dogs - 10€ Fallout new vegas - 8€ Guitar hero warriors of rock - 5€ Beyond two souls - 7€ Saints Row IV - 8€ Madden 11 - 3€ Shadow of Mordor - 9€ Killzone 3 - 6€ Tekken 6 - 6€ Guitar hero III Legends of rock - 5€ Guitar hero greatest hits - 7€ Grand theft auto IV - 8€ Guitar hero world tour - 5€ Gran turismo 5 prologue - 6€ Rockband - 5€ Wwe 2k14 neoriginalioi dežutei - 3€ Perkant daugiau nei 4 žaidimus nemokamas siuntimas. Siuntimas - 2€ Atsiskaitymai - Swed, Paypal. PS4 VR (PSVR) žaidimų sąrašą rasite skelbime http://www.skelbiu.lt/32387277.html (N) = Naujas, supakuotas Angry Birds: Star Wars (Move +) - 30 € Assassins Creed Chronicles - 25 € Assassins Creed Syndicate - 20 € Batman: Arkham Knight + Scarecrow Nightmare Mission Pack + Harley Quinn Story Pack (N) - 30 € Battleborn (N) - 10 € BattleField: HardLine - 15 € BattleField 1 - 17 € Bloodborne GOTY (N) - 35 € Brothers: A Tale of Two Sons (N) - 25 € BulletStorm Full Clip Edition - 20 € Call of Duty: Advanced Warfare - 15 € Call of Duty: Black Ops III - 20 € Call of Duty: Infinite Warfare - 10 € Call of Duty: WWII - 25 € Crash Bandicoot N. Sane Trilogy (N) - 33 € Dark Souls II (2): Scholar of the First Sin (N) - 35 € DeadPool - 20 €, (N) - 25 € Destiny - 15 € Destiny: The Collection - 20 € Destiny: The Taken King Legendary Edition (N) - 25 € Deus Ex: Mankind Divided (N) - 20 € Devil May Cry Definitive Edition - 25 € Dishonored 2 - 25 € Dishonored Definitive Edition - 25 € Dishonored: Death of the Outsider (N) - 25 € Disney Infinity 3.0: Star Wars Starter Pack - 20 € (tik atrištam PS4) Disney Infinity figūrėlių sąrašas: http://www.skelbiu.lt/26782907.html Doom - 20 €, SteelBook iš Collectors Edition (N) - 50 € Dragon Age: Inquisition - 20 € Dragon Ball (Z) Xenoverse (XV) - 30 € DriveClub (Only on PS, En, Ru) - 25 € Dying Light The Following Enhanced Edition (N) - 35 € Evolve (En, Ru) - 20 € Fallout 4 (N) - 25 € Far Cry 4 (En, Ru) - 25 € Far Cry Primal - 30 € Farming Simulator 15 (N) - 35 € FIFA 14 - 5 € FIFA 15 - 10 € FIFA 16 (N) - 15 €, Deluxe Edition (N) - 20 € FIFA 17 Deluxe Edition - 20 € FIFA 18 - 25 € Final Fantasy XV - 20 € For Honor (būtinas internetas) - 25 € God Eater 2: Rage Burst (N) - 29 € God of War (N) - 45 € God of War III Remastered (En, Ru) (N) - 25 € Grand Theft Auto V - 25 € Guilty Gear Xrd Sign - 20 € HellDivers (Super-Earth Ultimate Edition + PS3 ir Vita versijos + 11 DLC + Bonus, Only on PS) (N) - 30 € Homefront: The Revolution (N) - 15 € inFamous: First Light (Only on PS) - 25 €, (N) - 35 € inFamous: Second Son (Only on PS) - 25 € Injustice: Gods Among Us (Ultimate Edition) - 25 € Injustice 2 (N) - 30 € Just Cause 3 (N) - 30 € Just Sing (kamera +) (N) - 19 € KillZone Shadow Fall (Only on PS) - 15 € Kromaia Omega (N) - 20 € Lara Croft and the Temple of Osiris (Gold Edition su didele dėže, figūrėle, žemėlapiu ir knyga) - 50 € Lego Dimensions Starter Pack - 50 € Lego Harry Potter Collection - 30 € Mad Max (N) - 30 € Madden NFL 17 - 30 € Mafia III (3) - 30 € Metal Gear Solid V: Phantom Pain (N) - 25 € Metro Redux (Metro 2033 Redux & Metro: Last Light Redux) - 25 € Middle Earth: Shadow of Mordor GOTY (N) - 25 € Mirrors Edge Catalyst (N) - 25 € Mortal Kombat XL (N) - 25 € Murdered: Soul Suspect (En, Ru) - 25 €, (N) - 35 € Naruto Shippuden Ultimate Ninja Storm 4: Road To Boruto - 45 € NBA 2K14 (N) - 17 € NBA 2Ķ15 - 18 € NBA Live 14 - 12 € Need for Speed - 25 € NHL 16 (En, Ru) - 20 € NHL 17 (N) - 40 € No Mans Sky - 25 € Payday 2 Crimewave Edition (N) - 40 € Prey - 20 € Pro Evolution Soccer (PES) 2015 - 15 € Pro Evolution Soccer (PES) 2016 (N) - 25 € Professional Farmer 2017 - 20 € Project Cars - 30 € Project Cars 2 (N) - 39 € Ratchet & Clank - 30 € Resident Evil VII (7): Biohazard (PSVR +) - 35 €, (N) - 39 € Rise of the Tomb Raider (N) - 35 € Rogue Trooper Redux - 25 € Saints Row IV Re-elected (En, Ru) - 30 € Shadow Warrior (En, Ru) - 30 € SingStar Ultimate Party (Only on PS, reik mikrofono arba išmaniojo telefono, kamera +) (N) - 35 € Skylanders figūrėlių sąrašas: http://www.skelbiu.lt/21171540.html Star Wars BattleFront (N) - 30 € Street Fighter V (N) - 30 € The Amazing Spider-Man 2 - 45 € The Crew - 20 € The Crew Wild Run Edition (būtinas internetas) (N) - 25 € The Elder Scrolls Online: Morrowind (būtinas internetas ir PS+) (N) - 25 € The Elder Scrolls online: Tamriel Unlimited (būtinas internetas ir PS+) (N) - 20 € The Evil Within 2 (N) - 40 € The Evil Within Limited Edition + The Fighting Chance Pack (N) - 40 € The Heavy Rain & Beyond: Two Souls Collection (N) - 45 € The Last Guardian (Only on PS) (N) - 39 € The Surge (N) - 25 € The Walking Dead GOTY - The Complete First Season One 1 Plus 400 Days - 30 € The Witcher 3: Wild Hunt (N) - 40 € Titanfall 2 - 30 €, (N) - 40 € Tom Clancys Rainbow Six Siege - 30, (N) -35 € Tom Clancys The Division (N) - 30 € Transformers Devastation (N) - 27 € Troll and I - 25 € UFC (запрещено для детей) (N) - 25 € UFC 2 - 25 € Uncharted: The Lost Legacy (Only on PS) (N) - 35 € Until Dawn (Only on PS, kamera +) (N) - 35 € Warhammer End Times: Vermintide - 20 € Watch Dogs - 15 € Watch Dogs 2 - 35 € WWE 2K16 (N) - 30 € Zombi (N) - 25 € PS4 DualShock 4 pultas (20th Anniversary Limited Edition, naujas) - 58 € PS4 DualShock 4 pultas - 40 €, v2 (praktiškai naujas) - 50 € PSN Store 25 GBP papildymas (kodas pakuotėje kaip naujas žaidimas) - 39 €, be pakuotės - 36 € PSVR šalmas (nedaug naudotas) - 220 € PlayStation Plus (PSN + ) 12 mėn. narystė UK + Soma + OnRush + Iconoclasts (trumpalaikis pasiūlymas) - 57 € Parduodami fiziniai žaidimų diskai. Jei kažko reikalingo nėra sąraše, tai galima užsakyti. 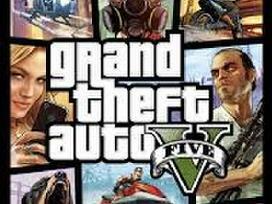 parduodu tikrus europietiškus originalius GRAND THEFT AUTO V 5 visoms konsolėms. Taip pat visas naujienas: Battlefield, Resident Evil, Dragonball, Dying Light, Far cry, NBA 2k18 Assassins creed, FIFA18 Destiny METRO REDUX, DIABLO, Wolfenstein, Watch dogs, Thief, minecraft, GTA 5 (grand theft auto V ) ir daugelį kt. ** PERKANT 4 žaidimus, penktas tik 0.01 € ! ** Aliens Colonial Marines Limited Edition - 6 € Alpha Protocol The Espionage RPG - 8 Eu Assasins Creed - 5 € Assassins Creed II - 7 Eu Assassins Creed III - 9 Eu Assasins Creed Rogue - 15 Eur Avatar: The Game - 9 Eu Batman Arkham Asylum - 8 € Batman Arkham City - 8 € Battlefield Bad Company - 7 € Battlefield Bad Company 2 - 8 € Battlefield 3 - 8 € Battlefield 3 Limited Edition - 10 € Battlefield 4 - 12 € Beyond Two Souls - 8 € Big Game HUNTER 2010 - 12 € (medžioklė) Bionic Commando - 6 € Bioshock 2 - 9 Eur Borderlands - 7 € Borderlands 2 - 8 € Bourne Conspiracy - 6 € Brothers in Arms: Hells Highway - 8 € Burnout Paradise - 10 Eur Call of Duty Advanced Warfare - 9 Eur Call of Duty Black OPS - 8 € Call of Duty Black OPS II (be originalios dėžutės) - 8 € CALL OF DUTY BLACK OPS II - 9 € Call of Duty: Ghosts - 9 € Call of Duty 4 Modern Warfare - 7 € Call of Duty Modern Warfare 3 MW3 - 9 € Call of Duty World at War -10 Eur Castlevania: Lords of Shadow - 11 € Crysis 3 - 9 Eur Darksiders - 7 € Deadpool - 16 Eur Dead Rising 2 - 6 € Dead Space 3 - 10 € Deadliest Catch Sea of Chaos - 12 € (žaidimas žvejams) Devil May Cry 4 - 7 € Disney Universe - 15 € Dragon Ball Z Battle of Z - 12 € Dragon Ball Z Ultimate Tenkaichi - 12 € Dungeon Siege 3 - 8 € Eyepet - 7 Eur Enchanted Arms - 10 € Elder Scrools IV Oblivion - 7 € Facebreaker - 6 € Fallen Angel: Sacred 2 - 10 € (panašus į Lineage 2) Fallout New Vegas - 6 € Far Cry 2 - 8 € Far Cry 3 Limited Edition - 11 € F1 Formula 1 2010 - 8 € F1 Race Stars - 14 € F1 2011 Formula 1 - 9 Eur FIFA 09 - 3 € Fifa 10 - 4 € FIFA 11 - 4 € FIFA 12 - 6 € FIFA 13 [be dėžutės] - 6 € FIFA 13 - 7 € FIFA 14 - 9 € FIFA 15 - 12 € FIFA 2010 World Cup: South Africa - 5 € FIFA 2014 World Cup: Brazil - 8 € Fracture - 6 € Godfather 2 - 11 € God of War Ascension - 11 € God of War Collection Remastered HD - 15 € Gran Turismo 5 - 8 € Gran Turismo 5 Prologue - 10 € Gran Turismo 6 - 14 € GRID 2 - 14 € GTA IV - 8 € GTA IV Episodes from Liberty City [The Complete Edition] - 12 € GTA V - 17 € Grand Theft Auto 5 - 17 € Guitar Hero World Tour - 9 € Heavenly Sword [Platinum Edition] - 8 € Hitman HD trilogy (trys žaidimai viename) - 15 € Homefront - 7 € Hunted The Demons Forge - 8 € inFamous - 7 € inFamous 2 - 9 € Just Cause 2 -11 € Kane And Lynch Dead Men - 10 € Kane & Lynch Dog Days 2 - 7 € Killzone 3 - 7 € Kingdoms of Amalur Reckoning - 12 € Little Big Planet - 7 € Little Big Planet : Game of the year edition - 9 € Little Big Planet : Karting - 15 € Little Big Planet 2 - 12 € L.A. Noire - 8 € Lego Star Wars: The Complete Saga - 12 € Lord of The Rings: Conquest - 11 € Lost: The Videogame - 8 € Lost Planet: Extreme Condition - 9 € Lost PLanet 2 - 7 € Madden 10 - 7 € Madden 12 (ledo ritulys) - 10 € Marvel vs Capcom 3 Fate of Two Worlds - 14 € Mass Effect 3 - 6 Eu Medal of Honor + Medal of Honor Frontline - 9 € Metal Gear Solid 4: Guns of the Patriots - 8 € Metro Last Light [Limited Edition] - 12 € Midnight Club Los Angeles - 8 € Mirrors Edge - 10 € Minecraft: Playstation 3 Edition - 17 € Monopoly - 18 € Motorbike Racing Pack (3 žaidimai) - 11 € Motorstorm - 6 € Motorstorm: Pacific Rift - 9 € Naruto Shippuden Ultimate Ninja Storm 3 - 13 € NASCAR 09 - 9 € Need for Speed: Most Wanted - 9 € Need for Speed: Shift - 10 € Need for Speed: Undercover - 10 € NBA 2K9 - 7 € NBA 2K11 - 7 € NBA 2K12 - 8 € NBA 2K12 [be dežutės] - 6 € NHL 10 - 8 € Operation Flashpoint Dragon Rising - 8 € Prince of Persia - 6 € Pure - 10 Eur Racedriver: GRID - 9 € RAMBO The Videogame - 12 € Remember Me - 8 € Resident Evil V - 9 € Resident Evil 5: Gold Edition - 10 € Resident Evil 6 - 10 € Resistance Fall of Man - 6 € Ride To Hell Retribution - 9 € Ruse - 9 € Sabot€ - 8 € Sacred 2 - 10 € (panašus į Lineage 2, Diablo 3 ) Sacred 3 - 11 € Saints Row 2 II -12 € Skate 2 [be org dėžutės] - 9 € Skate 3 - 11 € Sleeping Dogs - 10 € Smackdown vs Raw 2009 - 7 € Smackdown vs Raw 2011 - 8 € Splinter Cell Trilogy Remastered in HD - 15 € Star Wars: The Force Unleashed - 9 € Stranglehold - 8 € Terraria [kaip Minecraft] - 11 € The Bourne Conspiracy - 7 € The Elder Scrools: SKYRIM - 12 € The Godfather II - 11 € The Last of US - 13 € The Sabot€ - 7 € Thief - 7 € Tiger Wood PGA Tour (golfas) - 8 € Timeshift - 7 € Tomb Raider - 9 € Tomb Raider Underworld - 10 € Tom Clancys EndWar - 6 € Tom Clancys Ghost Recon Future Soldier - 6 € Tom Clancys Rainbow Six Vegas 2 - 5 € Tom Clancys Rainbow Six Vegas 2 PLATINUM - 5 € Tony Hawks Proving Ground - 12 € Transformers: Revenge of the Fallen - 9 € UFC 2009 Undisputed - 7 € Uncharted Drakes Fortune - 7 € Uncharted 2 Among Thieves - 8 € Uncharted 3 Drakes Deception - 10 € Vin Diesel Wheelman - 8 € Wanted: Weapons of Fate - 7 € Warhammer 40000: SpaceMarine - 8 € Watch Dogs - 10 € W12 (imtynes) - 7 € 2010 FIFA World Cup South Africa - 4 € 007 Legends [James Bond] - 10 Eu 007 Quantum of Solace - 7 € Ypatingi žaidimai: https://www.skelbiu.lt/skelbimai/ps3-zaidimai-vaikams-l-ps3-move-l-zaidimai-su-mic-40335053.html Pries perkant galima išbandyti. Siunčiame į kitus miestus, pristatymas per 1 darbo dieną.